Isn’t it great when you receive a surprise parcel in the post? Someone sending you something nice, just out of the blue. This happened to me the other day, when I received a beautiful collection of vintage lace from my mum’s cousin. 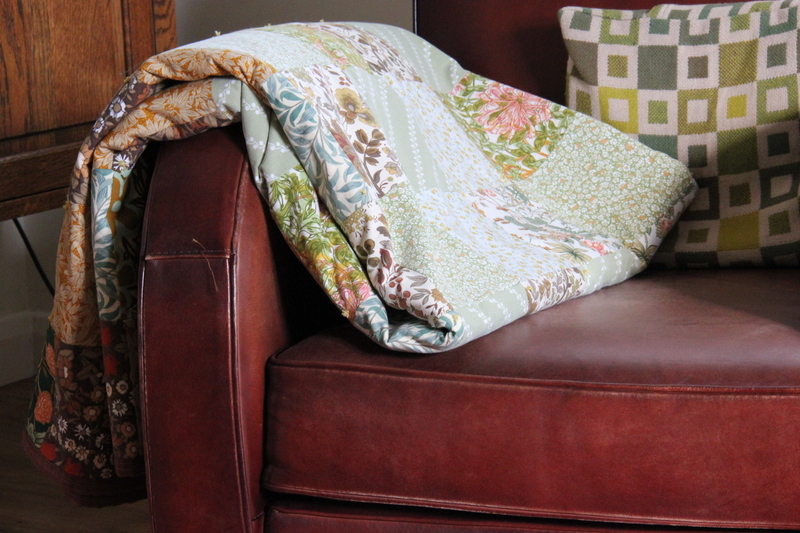 She had seen a tablecloth and a laundry bag I had made for my aunt which had been decorated with bits of lace rescued from my grandmother’s old bed linen. 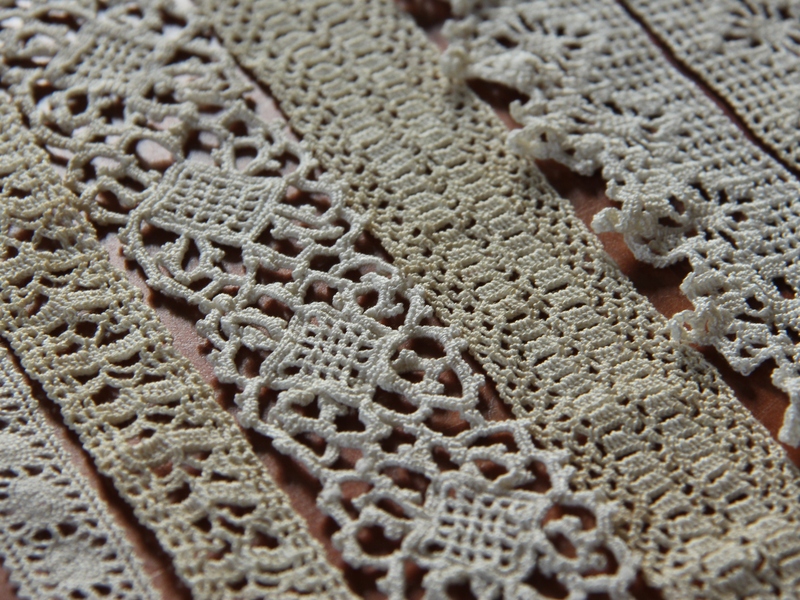 It turned out that she had a stash of lace rescued from worn out pillow cases and bed linen and some that she had crocheted herself. Although she’s very artistic (she’s a painter) she’s not into sewing and so didn’t really have a use for them. So, to my immense delight, she decided to send them to me! Aren’t they just beautiful! Although in general I’m not into a really frilly romantic style, I do have a soft spot for some very old-fashioned things like vintage lace. Because they are so decidedly romantic and feminine, it’s not always easy to think of a modern use for them (and this is probably the reason all the ladies in my extended family send them to me!). Combining them with plain white cloth seems to work best, as it keeps it simple. In some projects though I have gone then unashamedly romantic route and combined them with Liberty prints and other vintage style florals. Categories: Reusing old materials, Vintage | Tags: vintage lace | Permalink. I’ve been on a slight crafty detour over the last couple of days. 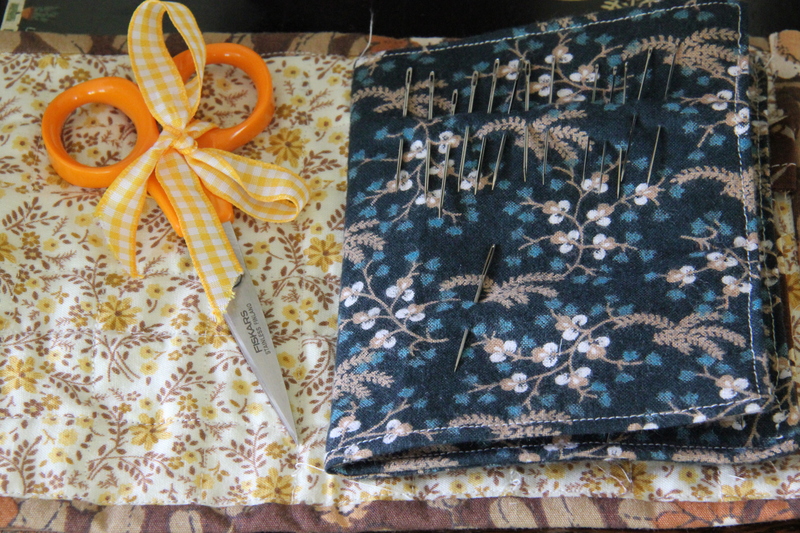 I was hoping to sew some patchwork projects for the garden but these projects are still in my head (although I have managed to wash and pre-shrink the fabrics so they are now ready to go). Instead, I felt a sudden need to organise my needles – this has never happened before (I’m not one of those enviable people whose craft tools and materials are kept neatly organised) so I thought I’d better follow the inspiration before it goes away…. 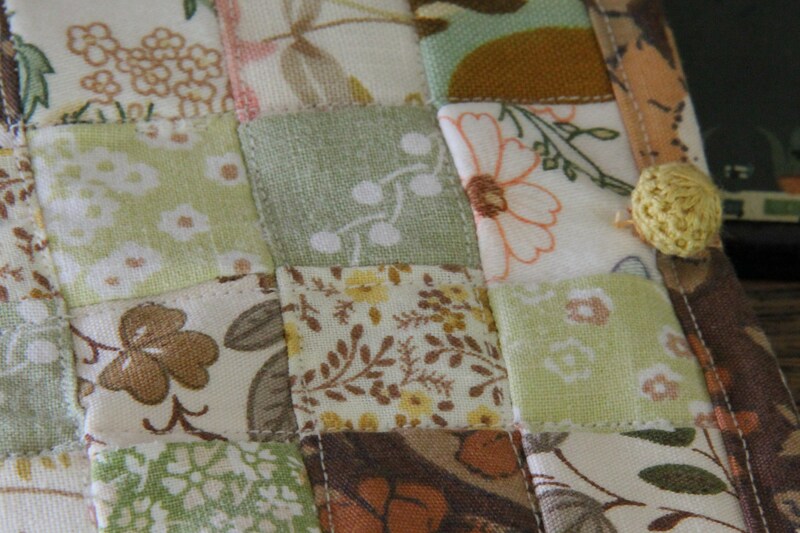 My inspiration came from a mini-patchwork needle case I saw in a magazine. It looked so cute I wanted to make one for myself. 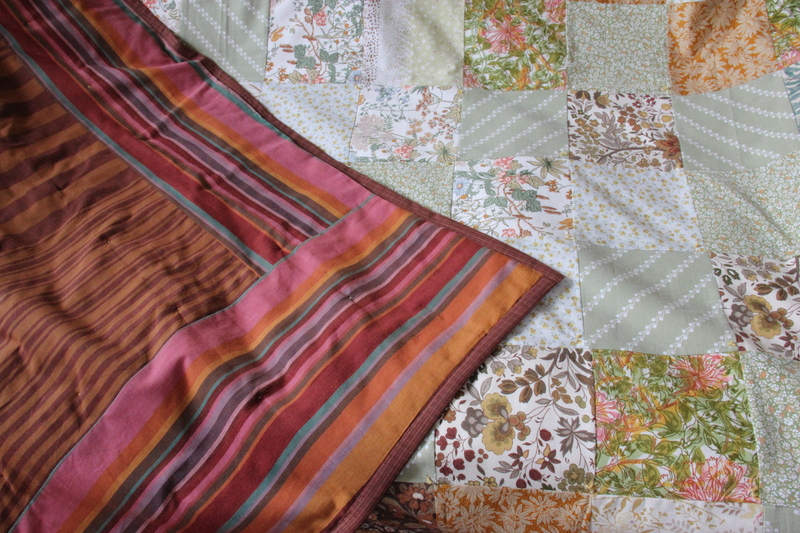 I used tiny scaps of vintage fabrics from my recent quilt project. 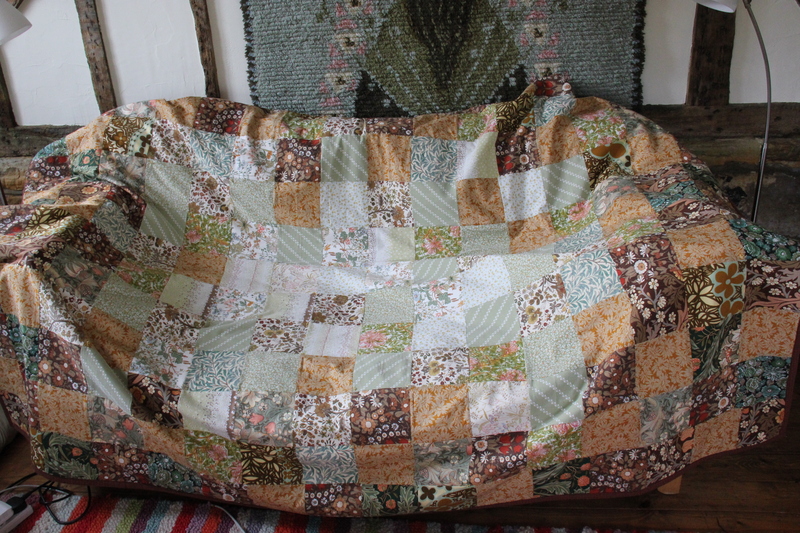 I did not cut each square individually, but I first sewed long thin strips together before cutting them the other way, saving lots of time and effort. I also decided to add a little pocket for my tapestry needles at the back, as they are too blunt to go through the fabric. In the end I fixed a piece of leftover ribbon to the front so that I can keep a pair of scissors in the case too. Unfortunately I must say the sewing itself doesn’t look very professional. When you are working on such small scale, even small wonkiness in sewing means that the edges of the squares are not really properly aligned. And my sewing is always a bit wonky even on a good day! And this one was made on a day I was feeling tired and impatient (not a good mood for crafts I admit…). 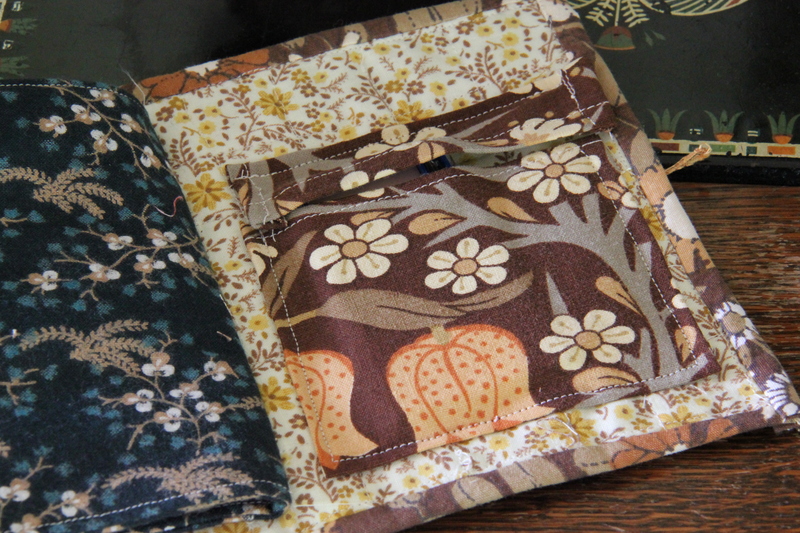 But this needle case is just for myself rather than a gift, so it doesn’t bother me, at least it looks home-made! Making such a miniature project was a lot of fun. It’s great to be able to complete a piece of work so fast. A real quick-fix dose of crafting! 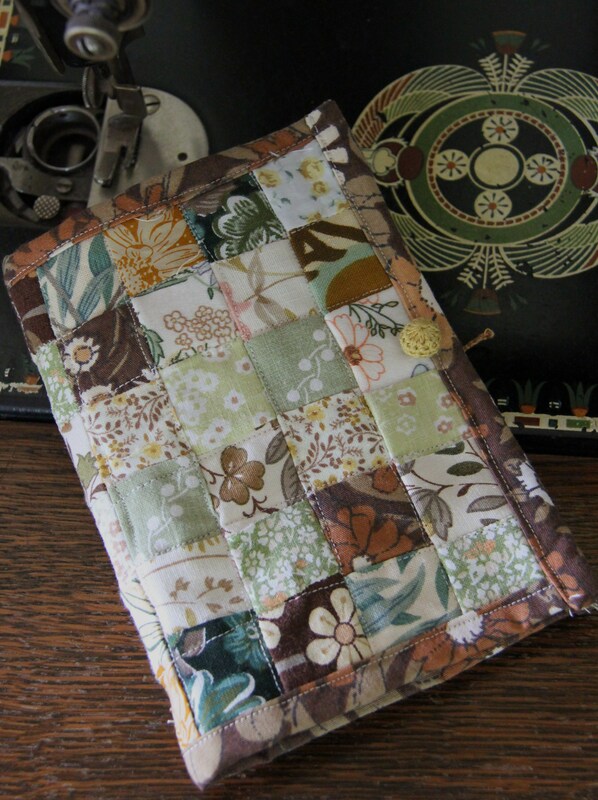 Categories: Reusing old materials, Vintage | Tags: needle case, patchwork, sewing, vintage fabrics | Permalink. My grandmother had a linen cupboard full of old-fashioned white cotton bed linen, decorated with lace and embroidered initials. When she passed away, my mother, aunt and I inherited these sheets. They’re of excellent quality, really thick cotton that is not easy to find these days. But after many years (decades even) of use, some of these sheets have worn out. 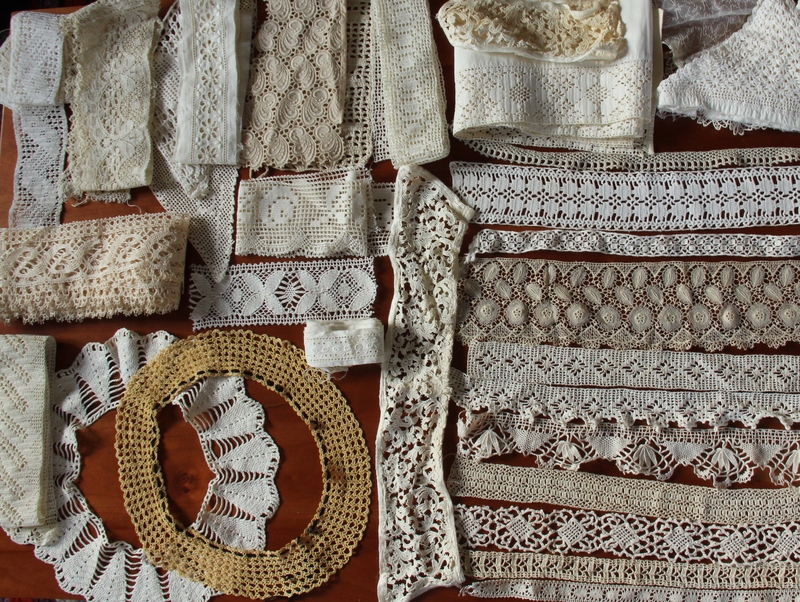 Being a hoarder of all types of things that might come in handy one day, I’ve kept all the lace, stored in a box which is full of romantic and feminine things such as lace, doilies and handkerchiefs. Things that I’ve either inherited or found on eBay, things that I often take out and admire, but never really use for anything. That’s because as much as I love the contents of that box, I have found it a little bit difficult to think of what to do with them. Some of them are very fragile and not in a very good condition. And on the whole, my taste in interior decoration is not very frilly and feminine, so lace doesn’t really go with it. 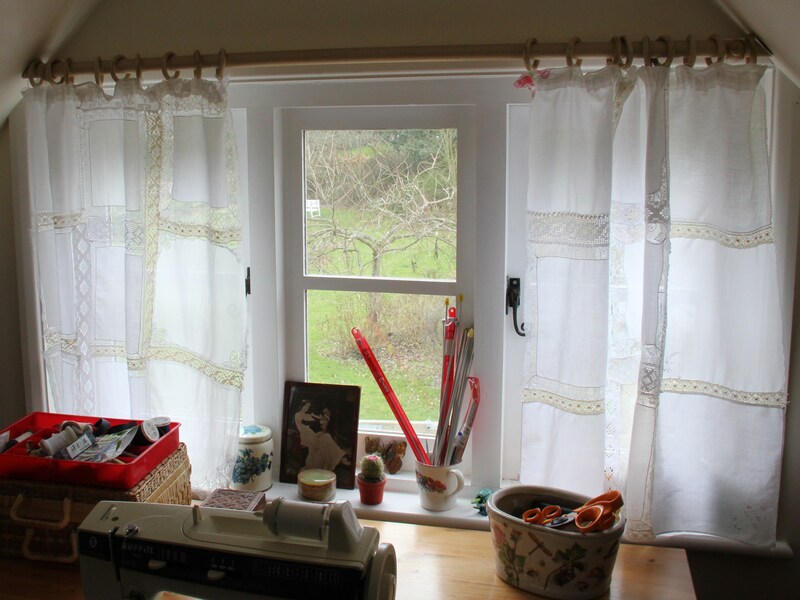 But when I needed curtains for my sewing room, I thought something old-fashioned and feminine would be just the right thing. 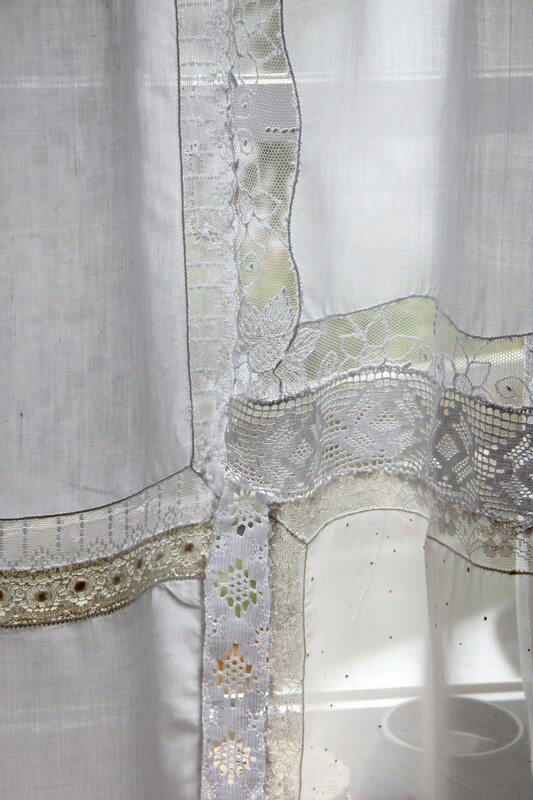 The main body of the curtains is made of old lacy handkerchiefs and I’ve used different types of border lace to fill in any gaps. I hand-sewed the pieces together, which wasn’t nearly as slow as I originally thought. In fact I found it strangely soothing and almost addictive. Despite the shabbiness of the lace, I quite like the results as the curtains suit the little attic room perfectly. 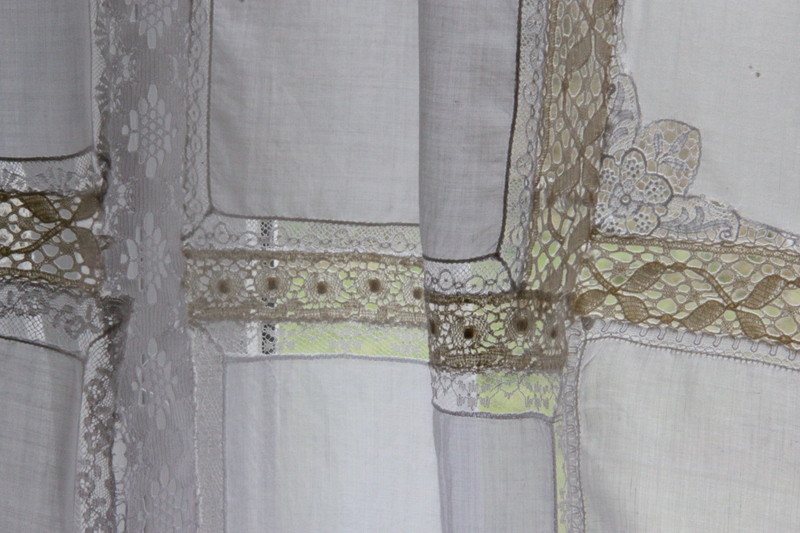 Categories: Curtains, Reusing old materials, Vintage | Tags: curtains, lace, lace handkerchiefs, vintage | Permalink.